The Albuquerque Comic Con is coming up on January 15th and 16th, and at least a couple of the Cheese Magneteers will be there — Tanzi’s flying into town, and I’ll be a guest at the show. Other guests include Peter “Chewbacca” Mayhew, Norman Reedus, Sean Patrick Flanery, Gene Ha, Lou Ferrigno, Deep Roy, Brian Pulido, Andy Kuhn, Dickey Beer, Mike Quinn, David Williams, Gil Gerard, Erin Gray, Herb Jefferson Jr., Anne Lockhart, Daniel Logan, David Della Rocco, Bokeem Woodbine, Grant Gould, Alaina Huffman, The Honky Tonk Man, Herb Dean and Michael Westbrook. The con is being held at the Albuquerque Hilton, 1901 University Boulevard NE. 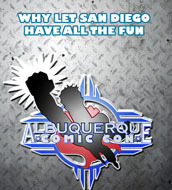 Check out the Albuquerque Comic Con website for more info, and be sure to stop by my table and say hi.